Diamond Alumni Centre! PICS Thanks, guys! Michelle & Seann tied the knot at the classy Hycroft Manor in Kits. Old Orchard Hall in Pt Moody. Great view of the ocean and we rocked well into the warm summer night! Swan-E-Set Golf & Country Club in Pitt Meadows. Beautiful summer weather and a night to remember! Emily & Tyler Woeste had the great idea of combining their reception with New Years Eve! What a PAR-TAY!! The classy Sutton Place Hotel hosted their 2 in 1 night and everyone had a blas. Check out the pics. Nicole Barre & Ryan Hughes had their reception at the classy Capilano Golf & Country Club in West Vancouver. It was a lovely evening and everything was "spot on, old boy" thanks to the hard work of Soha and Paris from Countdown Events. Patrick & Chantel Anderson put on a great party at the Fish House in Stanley Park. The first half of the evening featured our friend Karen Graves with her band Mimosa playing some cool jazz and French songs. We took over and cranked it up a notch and rocked till the wee hours. See the pics here. A beautiful setting on the shores of Lake Okanagan. They had their own personal fireworks show and it was a big one. 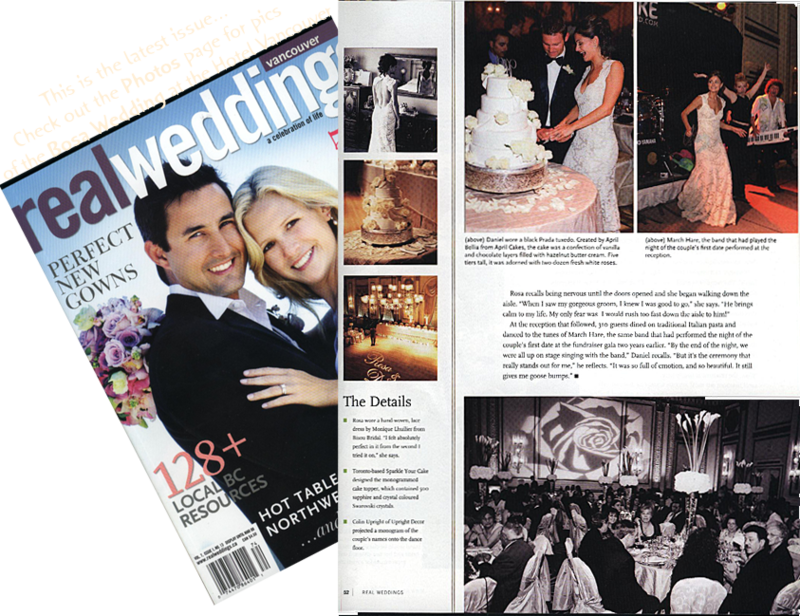 Daniel and Rosa Bosa put on the wedding to end all weddings at the Hotal Vancouver. Everything was first class - especially the partying! The whole gang was onstage jamming by the end of the night. Check out the pics here. Tod's been a friend of ours for years and we were happy to play at his wedding. Dan performed the actual wedding service himself and Andy played piano for the service. Tod tells us they had a great time on their honeymoon at the Grand Canyon. Ryan is an executive at the Jelly Belly Jellybean company based in Sacramento California and his bride was originally from Victoria, BC so they returned to her hometown for a lovely wedding in the Crystal Ballroom at The Fairmont Empress. Ryan asked us (with a generous bribe of Jelly Beans) to record a special song for him to practice his new dance moves. He was taking lessons just for his 'first dance'. Now that's dedication. A US Navy Pilot with about 100 friends, family and fellow officers brought us up to the Roundhouse at the top of the lift in Whistler. A memorable scene was when the groom walked arm in arm with his bride under the raised swords of his fellow officers at the end of which the other officers swatted the bride on her 'posterior' with the flat of their swords and shouted "Welcome to the Navy, Ma'am!" - Executive Plaza Hotel, Coquitlam We've had the pleasure of performing at several Coldwell Banker events including Gary Love's 60th birthday (guest appearance by Michael Buble), so when his son Derek decided to tie the knot they did it in high style. Daughter of West Coast Amusements owner - Pacific Inn, White Rock. We all had a great time - especially the guy who 'thought' he could play guitar. He waited till a little too late in the party before coming onstage to attempt to 'perform'. Grouse Mountain, Timber Room - certainly the most spectacular setting for a wedding in the Lower Mainland and it was a beautiful day. Awesome reception party for bride and groom Jacinthe Lebrun and Greg Dunlap. They pulled out all the stops and we rocked till 2 am. Swaneset Bay Resort and Country Club was the setting for Sara Coates' wedding. Sara's father Ed owns the Lordco Auto Parts stores in BC and we've had a great time performing at all his staff Christmas parties the last few years. Thanks and best of luck in the future, Sara. THANK YOU SO MUCH for making the wedding the event of the millenium for all of us! 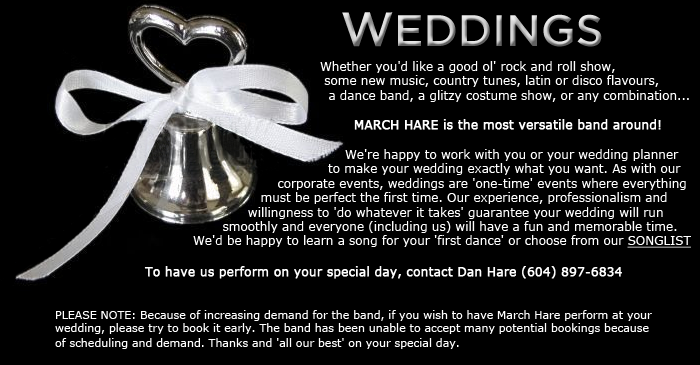 It was your band that set the mood, once the ceremony and dinner was over. I'm sorry to say that as the Mother of the Bride, I neglected my visiting duties because I could NOT seem to get off the dance floor. Your band is so awesome - it was so much fun! We danced and danced and danced, and even the "non-dancers" loved your music. We will pass your name on to everyone that we know in Victoria, and we'll definitely call you again when we have another occasion to do so! THANK YOU SO MUCH! Nova and Chris had a great party at the Chilliwack Fish & Game Club.Warm summer evening, lots of kissing at the head table. Gidio and Danielle Millin had a very cool traditional Italian wedding at the Famme Furlane Hall. Funny speeches (specially the groom), a touching slideshow and my god!, the ANTIPASTO! Awesome. The one and only Earl Campbell finally tied the knot and we were lucky enough to provide the music. Had a great time at the Hazelmere Golf & Country Club. Denise and Allan HARE had a great reception at the Best Western in Mission. Allan swears he chose us because of our name.